Israeli forces escalated the excessive use of force against protests in the West Bank and Gaza Strip. A Palestinian civilian was killed and 446 civilians; including 71 children, one woman and 12 journalists, were wounded in the West Bank and Gaza Strip. Israeli warplanes carried out several airstrikes at different targets in the Gaza Strip. A civilian was killed, and 21 other civilians, including 7 children and 4 women, were wounded. Israeli forces conducted 80 incursions into Palestinian communities in the West Bank and 9 similar incursions in Jerusalem. 280 civilians, including 67 children and 3 women, were arrested in incursions and protests. 82 of them, including 30 children and 2 women, were arrested in Jerusalem and its suburbs. Among those arrested was Sheikh Hasan Yousif, a Hamas Leader. Israeli forces continued to target border areas in the Gaza Strip. 8 Shooting incidents occurred in the border areas, but no casualties were reported. Israeli forces decreased the allowed fishing area to 6 nautical miles. 8 shooting and shelling incidents targeting the Palestinian fishing boats occurred in Gaza Strip. 9 Palestinian civilians, including 3 children, were arrested at the checkpoints in the West Bank. Israeli violations of international law and international humanitarian law in the oPt continued during the reporting period (07 – 13 December 2017). At approximately 01:00, Israeli forces moved into Qasrah village, southeast of Nablus. They raided and searched houses from which they arrested 22 civilians, including 2 children and many siblings. PCHR keeps the names of the arrested persons. At approximately 01:30, Israeli forces moved into Ya’boud village, southwest of Jenin. They raided and searched houses from which they arrested 4 Palestinian civilians, including a child. The arrested persons were identified as Sharf Mohamed Abu Baker (26), Mohamed Jihad Helmi Abu Baker (18), Ahmed Abed al-Hakeem Abu Baker (15), and Abdullah Ahmed Kamel Hirzallah (24). At approximately 02:00, Israeli forces moved into Beit Fajjar village, south of Bethlehem. They raided and searched a house belonging to Mohamed Jihad Taqatqah (22), and arrested him. 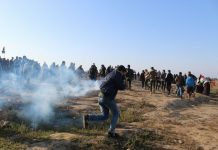 At approximately 20:00, Israeli forces stationed along the border fence between the Gaza Strip and Israel fired at least an artillery shell towards an empty land, east of Gaza Valley village (Juhor al-Deek) in the centre of the Gaza Strip. No casualties were reported. At approximately 20:10, Israeli forces stationed along the border fence between the Gaza Strip and Israel fired an artillery shell towards an empty land, southeast of al-Zaytoun neighbourhood, and no casualties were reported. At approximately 20:30, Israeli forces stationed along the border fence between the Gaza Strip and Israel, fired a shell towards a military watchtower belonging to the Palestinianarmed groups, east of al-Maghazi in the central Gaza Strip. As a result, the watchtower sustained material damage, and no casualties were reported. Note: During the aforementioned day, Israeli forces conducted (5) incursions in the following areas and no arrests were reported: Dura, Samou’a, Bani Na’iem, Beit Olah, and Dier al-‘Asal villages. At approximately 06:00, Israeli gunboats stationed off al-Sundaniyia shore, west of Jabalia refugee camp, north of the Gaza Strip, heavily opened fire at Palestinian fishing boats sailing within 4 nautical miles, fired shells at them and then chased them. The shooting continued until 06:30. As a result, the fishermen were forced to flee fearing for their lives, but no casualties were reported. At approximately 21:15, Israeli warplanes fired 5 missiles towards a military site belonging to al-Qasam Brigades, the military wing of Hamas Movement, southeast of Beit Lahia. The missiles blew up in the site and caused material damage in 3 residential buildings and a school adjacent to the site from the western side. As a result, Maher Mohamed Mohamed ‘Atallah (54), who was a heart patient, was killed as he sustained bruises throughout his body and sharp drop in heart rate. It should be noted that Maher was in front of his house, which is 100 meters away from the military site from the north-eastern side. Moreover, 21 Palestinian civilians, including 7 children and 4 women, were wounded. 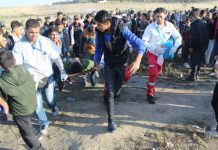 The wounded persons were then taken to the Indonesian Hospital in Jabalia refugee camp, where medical sources classified the health condition of a child as serious while the health condition of the others wounded was classified as minor as they sustained wounds and bruises. At approximately 21:20, Israeli gunboats stationed off al-Sudaniyia shore, west of Jabalia Refugee Camp, north of the Gaza Strip, heavily opened fire at Palestinian fishing boats sailing within 4 nautical miles. They also fired many shells at the fishing boats and then chased them. The shooting continued until 23:00. As a result, the fishermen were forced to flee fearing for their lives, but no casualties were reported. Note: During the aforementioned day, Israeli forces conducted (5) incursions in the following areas and no arrests were reported: Yatta, Dura, Hebron, Sa’ir and Biet ‘Omrah villages in Hebron. At approximately 01:00, Israeli forces moved into Beit Ummer village, north of Hebron, and then stationed in al-Duhor neighborhood. They also raided and searched a house belonging to Jihad Ali Sabarnah (38) and locked 5 of his family members in the living room. Few minutes later, a force of Israeli border guard officers arrived at the area and then raided the house. One of the officers attempted to attack Jihad’s wife. When Jihad tried to help his wife, the officer grabbed him from his neck and pushed him to the ground. The officer also beat Jihad up in front of his 2 sons Mohamed (14) and Waseem (12). When Jihad’s sons attempted to help their father, they were beaten as well. The Israeli soldiers stayed around half an hour in the house and before their withdrawal, they arrested Jihad’s son ‘Alaa (19). In the meantime, another force of Israeli soldiers raided a house belonging to Raied Moqbil Khalil Moqbil (39), from the same area, and handed his son ‘Alaa (16) a summons to refer to the Israeli Intelligence Service in “Gosh ‘Etzion” settlement, south of Bethlehem. It should be noted that ‘Alaa was arrested when he headed to the Israeli Intelligence Service. Furthermore, the Israeli forces raided 2 houses belonging to Mo’tasem Jamal ‘Alqam (19) and Kareem Ibrahim Hamdi Abu Mariyia (16) in al-Duhor and Sha’b al-Sair neighborhoods, and arrested both of them. At approximately 03:20, an Israeli drone fired a missile towards al-Qadisiyia military site belonging to al-Qassam Brigades, the armed wing of Hamas Movement, west of Khan Yunis, south of the Gaza Strip. Five minutes later, Israeli warplanes fired 2 missiles at the same site, which caused material damage in the area. However, no casualties were reported. At approximately 03:30, Israeli gunboats stationed off al-Sudaniyia shore, west of Jabalia, north of the Gaza Strip, heavily opened fire at Palestinian fishing boats sailing within 4 nautical miles and chased them. As a result, the fishermen were forced to flee fearing for their lives, but no casualties were reported. At approximately 03:40, Israeli warplanes fired 3 missiles at the former Civil Administration Site belonging to al-Qassam Brigades, the armed wing of Hamas Movement, east of Jabalia, north of the Gaza Strip. As a result, Kareem Mohamed Wesam Abu Namous (01), sustained bruises throughout his body while he was in his house, which is next to the site from the western side. The Bombing caused a huge explosion that rocked many areas in the northern Gaza Strip. As a result, the bombing also caused fear among civilians, especially women and children. At approximately 07:00, Israeli gunboats stationed off al-Sudaniyia shore, west of Jabalia, north of the Gaza Strip, heavily opened fire at Palestinian fishing boats sailing within 4 nautical miles. As a result, the fishermen were forced to flee fearing for their lives, but no casualties were reported. At approximately 08:50, Israeli gunboats stationed offshore, northwest of Beit Lahia, north of the Gaza Strip, heavily opened fire at Palestinian fishing boats sailing within 3 nautical miles. At approximately 09:40 on the same day, the Israeli forces opened fire again at the Palestinian fishing boats. As a result, the fishermen were forced to flee fearing for their lives, but no casualties were reported. At approximately 18:55, Israeli forces stationed in the watchtowers established north of an agricultural school, north of Beit Hanoun, north of the Gaza Strip. They heavily opened fire towards the border areas. The shooting caused fear among civilians, especially women and children, and no casualties were reported. At approximately 00:00, Israeli gunboats stationed offshore, northwest of Beit Lahia, north of the Gaza Strip, heavily opened fire at Palestinian fishing boats sailing within 3 nautical miles. An Israeli gunboat surrounded a Palestinian fishing boat for 30 minutes and forced the fishermen, who manned the boat, to take off their clothes and then jump into the water. The Israeli naval forces then released the fishermen along with the fishing boat. The fishermen returned after another fishing boat pulled them to the Gaza Seaport. At approximately 01:00, Israeli forces moved into Beit Kahel village, north of Hebron and stationed in the west of the village. They then raided and searched a house belonging to Mo’ien Mohamed Badawi al-Zohour (30) and arrested him. At approximately 22:30, Israeli forces moved into Taqou’ village, southeast of Bethlehem. They raided and searched a house belonging to Laith Ahmed Abu Mifreh (18) and arrested him. In the evening, Israeli soldiers stationed at “Beit Eil” military checkpoint, north of al-Bireh City, opened fire at Asma Kamal Hamad Waridat (25). As a result, Asma was hit with a live bullet to the right leg and then arrested. The Israeli forces took Asma via an Israeli ambulance to ‘Hadasah” Hospital in occupied Jerusalem. Ma’moun al-Hasheem, lawyer of the Palestinian Prisoner Club, who could visit Asma on Sunday, 10 December 2017, said that Asma came from Jordan to visit her relatives in Ramallah and was watching the clashes in the vicinity of the checkpoint, during which, an Israeli soldier opened fire at her. He added that, Asma was unjustifiably wounded and left bleeding for 15 minutes before taking her to the hospital. At approximately 03:40, Israeli forces moved into Rantees village, northwest of Ramallah. They raided and searched 2 houses belonging to Mohamed Majed Khalaf (27) and Osaid Ahmed Housha (24) and then arrested both of them. Around the same time, Israeli forces moved into al-Moghair village, northeast of Ramallah. They raided and searched houses from which they arrested the two siblings Mohamed (24) and Jihad Yousef Muhana (19); Murad Abed al-Qadir al-Muqati (27); Yazan Basam Hamidat (25); and Jihad ‘Aziz Abu Hamidiyia (20). At approximately 18:00, Israeli forces stationed in military watchtowers established on the lands of Um al-Nasir Bedouin village, north of the Gaza Strip, heavily opened fire at the border area. As a result, the shooting caused fear among civilians, especially women and children, and no casualties were reported. At approximately 20:30, Israeli forces moved into Kherbitha Um al-Mosbah village, west of Ramallah. They raided and searched houses from which they arrested ‘Odai Helmi Mahmoud al-Habal (23) and Mahamed Muneer Khalid Darraj (20). Note: During the aforementioned day, Israeli forces conducted (7) incursions in the following areas and no arrests were reported: Yatta, Hebron, Sa’ir, Ethna, al-Koum, and Ras al-Joura villages and al-Fawar refugee camp. At approximately 01:00, Israeli forces moved into Nablus. They raided and searched houses from which they arrested ‘Alaa Mohamed Abu Zant (22), from the Old City; Barra’ Radi Zuhaiman (20), from al-Makhfiyia neighborhood, southwest of the city; Mohamed Saleh Hamdan (24); and Bahaa Ghasan Thawqan (23), from al-Ma’ajeen neighborhood, northwest of the city. At approximately 01:30, Israeli forces moved into Askaka village, east of Salfit. They raided and searched a house belonging to Zuhair Fawaaz Abdullah Husain (48) and then arrested him. Around the same time, Israeli forces moved into Beit Fujjar village, west of Bethlehem. They raided and searched a house belonging to Khalil Taha Taqatqah (24) and then arrested him. At approximately 02:00, Israeli forces moved into Tal village, southwest of Nablus. They raided and searched houses and then arrested ‘Asem Jameel Shtaieh (25). Around that same time, Israeli forces moved into Madama village, south of Nablus. They raided and searched houses and then arrested Bashir Saleem Hamed Ziyadah (31). Around the same time, Israeli forces moved into Bethlehem and stationed in Wadi al-Ma’ali neighborhood in the center of the city. They then raided and searched a house belonging to Abdullah ‘Ata al-Hurami (18) and then arrested him. At approximately 02:30, Israeli forces moved into ‘Arabah village. Southwest of Jenin. They raided and searched houses and then arrested Khadir ‘Adnan Mohamed ‘Isaa (39), the leader of Islamic Jihad Movement. At approximately 03:00, Israeli forces moved into al-Mazra’ah village, northwest of Ramallah. They raided and searched a house belonging to Milad ‘Emad Sa’ayidah (15) and arrested him. At approximately 06:45, Israeli gunboats stationed offshore, northwest of Beit Lahia, north of the Gaza Strip, heavily opened fire at Palestinian fishing boats sailing within 3 nautical miles. As a result, the fishermen were forced to flee fearing for their lives, but no casualties were reported. At approximately 08:10, Israeli forces moved into Dier al-Ghosoun village, north of Tulkarm. They raided and searched a house belonging to Salama Tawfiq Basheer Badran (36) and arrested him. At approximately 10:30, Israeli forces moved into al-Showikah suburb in Tulkarm. They raided and searched a house belonging to Mahmoud Jamal Mahmoud Tayieh (32) and arrested him. At approximately 16:35, Israeli forces moved into Kafur Lobad village, east of Tulkarm. They raided and searched a house belonging to Khalid Ibrahim Mostafa Barhoush (23) and arrested him. At approximately 16:50, Israeli forces fired 2 artillery shells at a military watchtower belonging to the Palestinian armed groups, east of Gaza Valley (Juhor al-Deek), and no casualties were reported. At approximately 21:05, Israeli forces fired 2 artillery shells at a military watchtower belonging to al-Qassam Brigade, the armed wing of Hamas Movement, east of al-Sifa area, northwest of Beit Lahia, north of the Gaza Strip. The military watchtower is about 400 meters away from the border fence between the Gaza Strip and Israel. As a result, the bombing caused material damage to the watchtower, and no casualties were reported. At approximately 23:00, Israeli forces moved into Sa’ir village, northeast of Hebron, as there was a protest at the entrance to the village. The Israeli forces closed the village entrance and then Israeli infantry units deployed on the village streets. They then indiscriminately fired sound bombs at Palestinian civilians’ houses and roofs. Many houses were raided and searched, and the Israeli forces handed the families a threatening message from the Israeli Commander. The message was as follows: “This area is witnessing terrorist activities by stone throwers, and if you do not stop these acts, your houses will be raided”. Mohamed Fawzi Faroukh (40), who is a heart patient, said that the Israeli forces violently raided his house after damaging the house main door and then fired sound bombs at the entrance to inform them about the message. Moreover, the Israeli forces fired a sound bomb at the balcony of ‘Emad Fawzi al-Faroukh, in addition to firing other sound bombs at the village school yard. The abovementioned sound bomb did not explode and on the next day morning, students found it. Note: During the aforementioned day, Israeli forces conducted (6) incursions in the following areas and no arrests were reported: Wad al-Fare’ah, south of Tubas; al-Fawar refugee camp, Ethna and Beit ‘Youn villages in Hebron; and Qafeen village in Tulkarm. At approximately 01:00, Israeli forces moved into Kafur Qalil village, south of Nablus. They raided and searched houses and then arrested Saleh Sa’di ‘Amer (27). Around the same time, Israeli forces moved into Beit Ummer village, north of Hebron. They raided and searched houses from which they arrested Anwar Yousef Ikhdair ‘Awad (22), Montaser Abed al-Hameed Muhasin Za’aqeeq (24), and Ahmed Ref’at Jameel al-Silibi (19). As a result, the number of arrested persons in the village has amounted to 185; half of them are children, since the beginning of this year. At approximately 01:30, Israeli forces moved into Husan village, west of Bethlehem. They raided and searched a house belonging to Ahmed Abed al-Salam Za’oul (28) and arrested him. Around the same time, Israeli forces moved into Qalqiliyia and then raided and searched 2 houses belonging to Mahmoud Taleb Aghbari (35) and Osama Wasfi Dawoud (30). Mahmoud and Osama were arrested and taken to an unknown destination. Following that, the Israeli forces raided and searched the Islamic Club in the city and closed it after damaging the doors and locks. They also hanged a closure and threat order to anyone dealing with the club. The Israeli forces claimed that the club was used for inciting to carry out terrorist activities against Israeli soldiers. At approximately 02:00, Israeli forces moved into al-Hawwouz neighborhood in Hebron. They raided and searched a house belonging to Kamel Sa’di Jamjoum (21) and arrested him. Around the same time, Israeli forces moved into Dier Samet village, southwest of Duram southwest of Hebron. They raided and searched a house belonging to Dawoud Rasmi al-Hroub (22) and then arrested him. At approximately 02:30, Israeli forces moved into Tal village, southwest of Nablus. They raided and searched houses from which they arrested 2 siblings Baraa (21) and Mahmoud ‘Ali ‘Asidah (25). Around the same time, Israeli forces moved into Northern ‘Asirah village, north of Nablus. They raided and searched 2 houses belonging to Dirar Ahmed Hamadnah (55) and Obai Hasan Sa’ied Hamadnah (31) and then arrested both of them. Dirar and Obai were taken via a military vehicle to the village entrance, where they were questioned inside the vehicle and then released. At approximately 09:35, Israeli forces stationed in the military watchtowers established east of al-Ahmar area, east of Beit Hanoun, north of the Gaza Strip, opened fire towards the border area. As a result of the shooting, Palestinian famers were forced to flee for fear of being wounded, and no casualties were reported. At approximately 16:35, Israeli forces stationed in the military watchtowers established east of al-Ahmar area, east of Beit Hanoun, north of the Gaza Strip, opened fire towards the border area, and no casualties were reported. Note: During the aforementioned day, Israeli forces conducted (3) incursions in the following areas and no arrests were reported: Tulkarm; Kafur al-Deek village, west of Salfit; and Hawarah village, south of Nablus. At approximately 00:10, Israeli forces moved into Tulkarm. They raided and searched a house belonging to Mohamed Sa’ied Salah (28) and then arrested him. At approximately 01:00, Israeli forces moved into Nablus and then raided and searched houses. They arrested Yaser Khalid Mohamed Manaa’ (28), Suliman Akram Mahmoud Abu Salah (30), and Mo’az Saleem (28). Around the same time, Israeli forces moved into al-Karma village, southeast of Dura, southwest of Hebron. They raided and searched houses and then arrested Laith Ziyad Khalil ‘Awawdah (19). At approximately 01:30, Israeli forces moved into Qaryout village, southeast of Nablus. They raided and searched houses from which they arrested Jihad Salah al-Deen Badawi al-Boum (42) and Hussain Mohamed Hussain Mardawi (52). Around the same time, Israeli forces moved into Ya’bod village, southwest of Jenin. They raided and searched houses and then arrested Ahmed Sadiq Abu Baker (18). At approximately 01:45, Israeli warplanes fired 2 missiles at a military site belonging to al-Qassam Brigade, the armed wing of Hamas Movement. 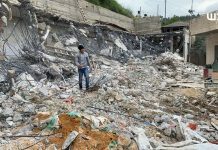 The site, which is located next to the beach, southwest of Khan Yunis, was destroyed. 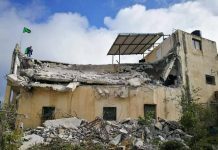 Around the same time, Israeli warplanes fired a missile at an empty land in al-Najjar neighborhood in al-Mawasi area. As a result, the bombing caused a large hole and partial damage in 11 houses. Moreover, 3 persons, including a woman and a child, sustained shrapnel wounds. At approximately 02:00, Israeli forces moved into Jenin. They raided and searched houses from which they arrested PLC member Khalid Yehia Sa’eed (59), Tareq Hilal Ma’ali (22), Mohamed ‘Awad al-Jamal, Huzaifa al-Jamal, Ashraf Mohamed al-Jamal, and Rami ‘Awaad. The arrested persons were questioned and then released, except Tareq, who is so far under arrest. Around the same time, Israeli forces moved into al-Fawar refugee camp, north of Hebron. They raided and searched houses from which they arrested Sami Mohamed Sha’ban Janazrah (40); Saher Mahmoud Ghatasha (26) and his brother Ibrahim (22); and Ahmed Kamal Abu Tu’aimah (21). At approximately 02:15, Israeli forces moved into Tubas City. They raided and searched houses from which they arrested Muhib Khalid Daraghmah (20), and the two brothers Mohamed (24) and Ibrahim jamal Suliman Daraghmah (21). Around the same time. Israeli forces moved into ‘Orta village, southeast of Nablus. They raided and searched houses and then arrested Samer Saleem Sa’ied Shurab (42). Around the same time, Israeli forces moved into Bitah village, southeast of Nablus. They raided and searched houses and then arrested Basil Khalid Mohamed Dwikat (31). At approximately 02:30, Israeli forces moved into Qablan village, southeast of Nablus. They raided and searched houses and then arrested Firas ‘Isaa Az’ar (32). At approximately 02:40, Israeli forces moved into al-Mughair village, northeast of Ramallah. They raided and searched houses from which they arrested Yehia Badir Abu ‘Alyia (23), Yehia Jouda Shehadah (20), ‘Isaa Subhi Shehadah (19) and Jihad ‘Afeef Abu ‘Alyia (24). At approximately 03:00, Israeli forces moved into Kharsa village, south of Dura, southwest of Hebron, and stationed in Muthalath al-‘Aqabah area. They then raided and searched a house belonging to Moahmed ‘Ayid al-Shahatebt (50) and arrested his son Mohamed (18). In the meantime, another force of Israeli soldiers raided and searched a house belonging to ‘Alaa Kamel Badawi Baryoush in al-Dair neighborhood and then arrested him. At approximately 03:30, Israeli forces moved into Betounyia village, west of Ramallah. They raided and searched a house belonging to PLC Member Hasan Yousef (62) and then arrested him after locking his family members in one room. Around the same time, Israeli forces moved into Silwad village, northeast of Ramallah. They raided and searched houses from which they arrested Mohamed Maher Hamed (19), Mohamed Lotfi Hamed (22), and ‘Alaa Saber Hamed (18). Note: During the aforementioned day, Israeli forces conducted (8) incursions in the following areas and no arrests were reported: Dura, Hebron, Sureef, Ethna, and Moreq villages in Hebron; Sida village, northeast of Tulkarm; and al-Fondoq and Kafur al- Thulth villages, east of Qalqiliyia. Around the same time, Palestinian civilians organized a protest in the vicinity of “Jishuri” Factories, west of Tulkarm. Israeli forces fired metal bullets, sound bombs and tear gas canisters at the protestors. As a result, 8 civilians, including 3 children, were wounded. Five of them sustained live bullet wounds, 2 civilians sustained metal bullet wounds and a civilian was hit with a tear gas canister. On Thursday, 07 December 2017, Israeli authorities allowed 2 persons from the Gaza Strip to perform the Friday prayer in al-Aqsa Mosque. Ramallah: Israeli forces established (15) checkpoints all over the city. On Thursday, 07 December 2017, Israeli forces established 5 checkpoints at the entrance to al-Nabi Saleh village; at the intersection of “Halmish” settlement, northwest of Ramallah; at ‘Ain Yabroud bridge, northeast of the city; and at the entrance to Shaqbah village, west of the city. On Friday, 08 December 2017, Israeli forces established 2 checkpoints under the bridge of ‘Atara village, north of Ramallah; and at the main entrance to Silwad village. Northeast of the city. On Saturday, 3 similar checkpoints were established at the main intersection of ‘Ain Sinah village; at ‘Atara village’s bridge, north of the city; and at the intersection of al-Taibah village (om al-Mo’arajat road between Ramallah and Jericho). On Sunday, 10 December 2017, Israeli forces stationed at al-Mahkama checkpoint closed the northern entrance to al-Bireh city and al-Bireh-Nablus Street, near al-Jalazoun refugee camp, north of al-Bireh. They also closed with cement cubes the entrance to Silwad village. They then established 6 checkpoints at the entrances and intersections of ‘Ayoun al-Haramiah, Hizmah, Jabi’, al-Nabi Saleh, Deir Ibzigh, and Ras Karkar villages. Hebron: Israeli forces established (24) checkpoints all over the city. At approximately 10:00 on Thursday, 07 December 2017, Israeli forces established an iron gate at the entrance to ‘Abdo village, southeast of Dura, southwest of the city, separating it from “60” bypass road. As a result, the Palestinians’ movement was obstructed. On the same day, the Israeli forces established 4 checkpoints at the southern entrance to Dura, at the entrance to al-Fawar refugee camp, at the northern entrance to Hebron, and at the entrance to Beit Ummer village. On Friday, 08 December 2017, Israeli forces established 6 checkpoints at the entrance to al-Fawar and al-Aroub refugee camps, at the northern entrance to Hebron, at the northern entrance to Yatta village, at the entrances to Kharsa and Ummer villages, and on Tarousa Road between Dura City and its western villages. On Sunday, 10 December 2017, Israeli forces established 4 checkpoints at the entrances to Ethna, Bani Na’iem and al-Moreq villages and at the entrance to al-Fawar refugee camp. On Monday, 11 December 2017, 5 similar checkpoints were established at the southern entrance to Hebron (al-Fahs); on Tarousa Road, west of Dura; at the entrance to Samou’a village, at the entrance to Wad al-Jouz Road, east of Bani Ma’iem village; and on al-Hawawour Road. On Wednesday, 13 December 2017, Israeli forces established 5 checkpoints at the southern entrances to Halhoul village and Hebron, at the entrance to Beit Ummer village, and at the entrance to al-‘Aroub refugee camp. Qalqiliyia: Israeli forces established (5) checkpoints all over the city. On Sunday, 10 December 2017, Israeli forces established 3 checkpoints between ‘Azoun and Kafur Laqif villages, between the entrances to ‘Azoun and Kafur Laqif villages and between Jayyous and ‘Azoun villages, east of Qalqiliyia. On Monday, 11 December 2017, Israeli forces established 2 checkpoints at the eastern entrance to Qalqiliyia and at the entrance to ‘Azoun village, east of the city. Salfit: Israeli forces established (10) checkpoints all over the city. At approximately 23:00 on Thursday, 07 December 2017, Israeli forces established a checkpoint at the eastern entrance to Kaful Hares village, north of Salfit. At approximately 21:20 on Friday, 08 December 2017, Israeli forces established a checkpoint at the intersection of Qarawet Bani Hassan village, northwest of Salfit. On Saturday, 09 December 2017, 3 similar checkpoints were established at the entrances to Kafur al-Deek and Deir Balout villages, west of Salfit, and at the entrance to Askaka village, east of the city. On Monday, 11 December 2017, Israeli forces established 5 checkpoints at the northern entrance to Salfit; at the entrance to Kafur al-Deek village, at the entrance to Burqeen village, west of the city; at the northern entrance to Merdah village, north of the city; and under the bridge of Askaka village, east of the city. At approximately 15:25 on Friday, 08 December 2017, Israeli forces tightened its measures at ‘Inab checkpoint, east of Tulkarm, and obstructed Palestinian civilians’ movement. At approximately 19:20, the Israeli forces tightened its measures again and obstructed the Palestinians’ movement until 20:20. At approximately 03:00 on Friday, 08 December 2017, Israeli forces established a checkpoint at the eastern entrance to Qalqiliyia. They searched Palestinian civilians’ vehicles and checked their IDs. They then arrested Mohamed Fathi Mohamed al-Baz, from Nablus. At approximately 11:00, Israeli forces stationed near the military watchtower established at the annexation wall in Beit al-Roush al-Fouqa area, west of Dura, southwest of Hebron, arrested Wisam ‘Isaa Haribat (28) and Basil Sufian Kashour (30). The reason for their arrest is still unknown. At approximately 14:00 on Friday, Israeli forces deployed in the Hebron’s Old City neighborhoods and arrested Mohamed Maher Qafisha (30) while he was near the old municipality office. The Israeli forces claimed that Mohamed’s vehicle collided with a military vehicle by mistake. At approximately 12:00 on Sunday, 10 December 2017, Israeli forces established a checkpoint at the entrance to Hablah village, south of Qalqiliyia. They searched Palestinian civilians’ vehicles and checked their IDs. They then arrested Omar Mo’ien Hussain (21), from ‘Azoun village. On Tuesday, 12 December 2017, Israeli forces stationed at a military checkpoint established at the southern entrance to al-Ibrahimi Mosque in the Hebron’s Old City, arrested Bashar Jehad Ghaith (17), and Mahmoud Ali al-‘Ajlouni (17). Both of them were then taken to a police station in “Kriyat ‘Arab’” settlement, east of the city. At approximately 12:00 on Wednesday, 13 December 2017, Israeli forces arrested Abdullah al-Badan (39) along with his son Jawad (16), at the intersection of Western Taqou’ village, southeast of Bethlehem.